The Circus is coming to a city near you! 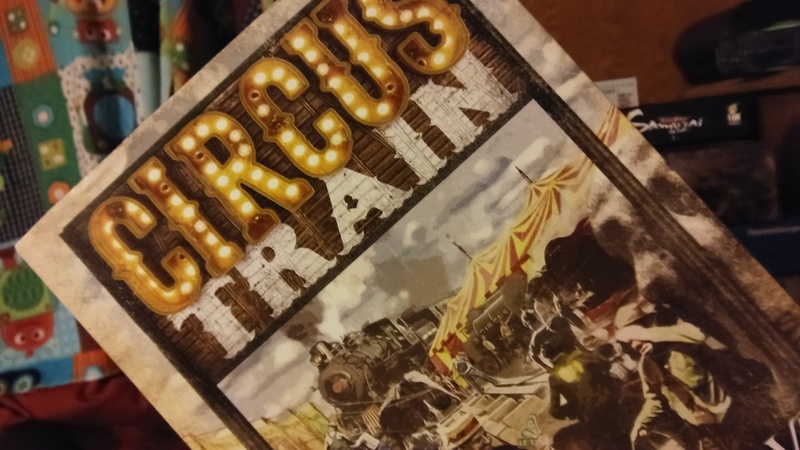 In Circus Train, each player plays as the operator of a small circus trying to be the most prestigious circus in the land. Everyone knows to be a great Circus you need talent that meets the demands of the cities you travel to. It’s not an easy life being on the road but the rewards are sweet. As you move from town to town, occasionally going back home to rest, you will recruit talent from other circuses that just didn’t make the cut or from your competitors. After performing at a city, you will gain a Performance Score and have money in your pocket ready to hit the road again. At the end of each month soring will indicate who has the best stuff in the business. Once all is said and done, will you have what it takes to be King of the Big Top? At the beginning of the game each player will choose a color and get all the necessary pieces for that color. 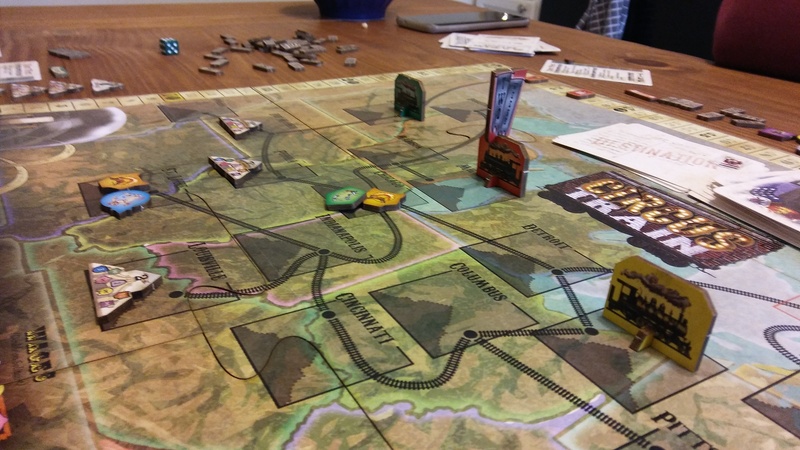 The main items are a circus train standee, 9 action cards, a Performance chit and a victory point chit and a special two week token that will be used in the last few months of the game. Each player starts with a clown and two other talents of their choosing between acrobats, horses and the freak shows. Shuffle the destination cards and put them on the destination pile. Separate the circus tents by color, including green, yellow and red. 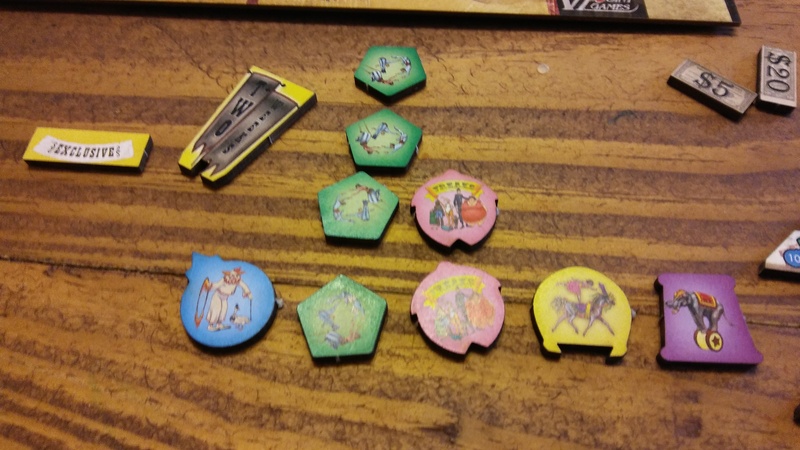 Draw destination cards and put green circus tents on cities until there are a total of 8 on the board. Shuffle the event cards and place them on an empty spot of the board. The game is divided into 6 months, each month having either 4 or 5 weeks. Each week is a round. In a round there will be 2 phases. The first phase of the week is the Ringmaster Phase. In this phase, in player order, each player will play one action card from their hand and do the action on the card. Most of these cards involve moving, which is optional and performing or hiring talent at a city. Sometimes, you do both and sometime one or the other. This is determined by the key words on the card. If it says “and” you can take both actions listed on the card but if it states “or” you will have to choose which of the two actions you take. The second phase is the Roustabout Phase, this is your typical Upkeep phase where new tiles are added to the board, advance to the next week and do any events if it is the start of a new month. At the end of the month a few extra things happen. There is a scoring that occurs. Who ever has the highest Performance Score will get 7 points, second will get 4 and third will get 2. You also get points if you have the most of any certain type of talent. For example, if you have the most acrobats, you will get points based on how many you have. If you have 4, and these are the most in the game between the other circuses, you will get 4 points. The game will end after the Ringmaster Phase of the last week of September. Players will then gain or lose victory points based on certain criteria. The most clowns will get 5 bonus points, if someone has no clowns they will lose 3 points as variety is key in the circus business. The player with the most money will get 5 bonus points. If you have no Large Animals in your circus you will lose 5 points. Large animals include horses, tigers and elephants. Lastly who ever has the most performances will earn 5 bonus points. The player with the most points will be the Greatest Ringmaster of his generation! 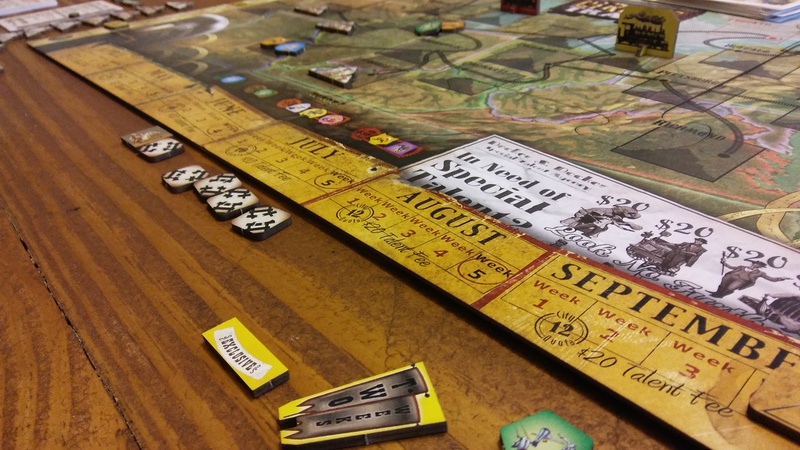 I absolutely love the components in this game! They are very thematic and done extremely well. The circus tents are fantastic! Everything fits nicely with the standees being just tight enough to stay on but not too tight that they don’t fit. The art and tokens are great. It all really ties the theme together. The event cards are great! My favorite component is the money!! 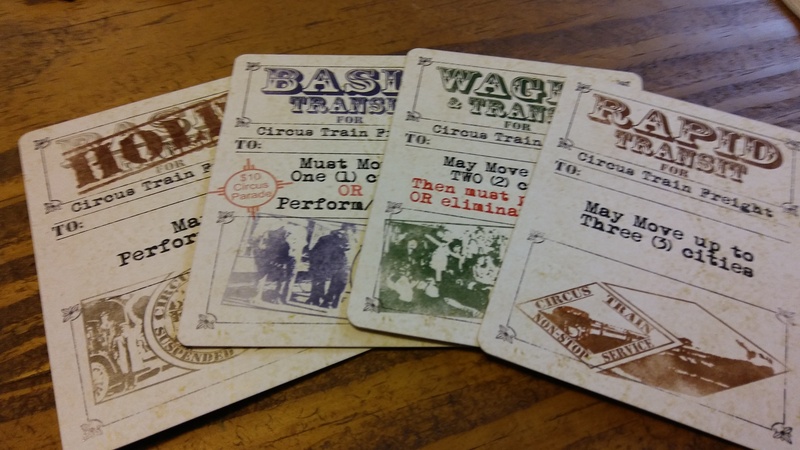 For all those games that like paper money or think it is too expensive to make good token money…..take a look at the money in Circus Train. Simple, easy and quick to use! Money doesn’t need to be big and flashy and metal….it just needs to be serviceable, easy to manage and sturdy! The components are great! Aside from the Components this was the star of the show for me. There are quite a few mechanisms in this game that I really enjoy. First being the action cards! There is a ton of strategy in these things. When to play what card, how to get to a performance before others, how to get back to Canada to use the Rest Action. When to pay wages…..it is great. The wages makes the game even better. You have to pay your talent in this game but instead of making you pay it at the end of each month or week, you get to choose when to pay it, as one of your actions. Maybe you want to pay it early before your hire new talent and get it out of the way, or you most likely need to do a couple more performances to get more money before paying. I love that I get that choice. The next mechanism is the Performance Score. When you go to perform at a city, you will get a Performance Score based on what talent you have and what the people of that city want to see. You get a base value at the top of the tent then added points for matching Talents. BUT that is not it……you also get the base value of ALL your previous Performances. I love how you get done with a Performance but it doesn’t just go away but you also get points for it in the long run. If your performance score out does your previous high score, you get paid more money for that Event. It just feels so thematic! 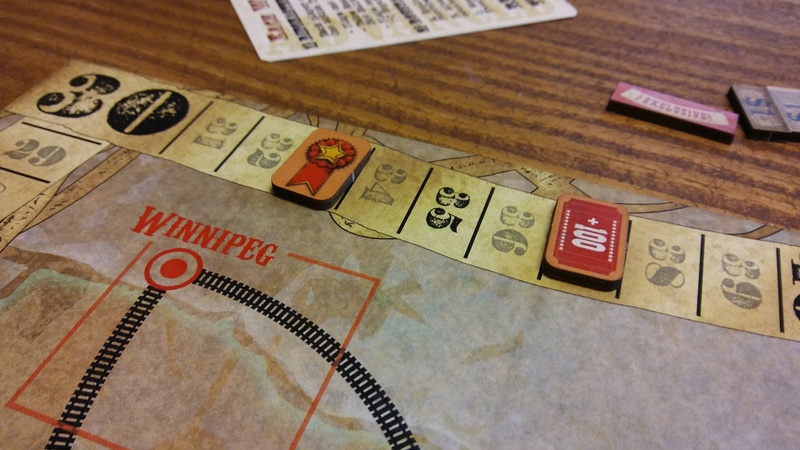 The last mechanism that I really like about this game is the scoring. You score at the end of every month on highest performance score and who has the most of each talent. Clowns may be cheap and worth the least amount of performance points but if you horde all the clowns early you can get a ton of points through out the game at month’s end, but then others might come and steal your clowns for their circus. There can be a lot of take that in this game that can almost feel like a bummer but the other mechanisms outweigh those! I’m not sure where I stand on the replayability??? There are not very many different strategies to take but it feels different when each time you play it. The Event Cards are a nice touch and being that you only use 5 out of the 26 in a single game, you will not run into the same ones very often. Other than that, you are going through the same motions each game, though the puzzle of playing the action cards keeps it very entertaining. The replayablility is not great but not horrible so I will keep it right in the middle. There is also the basic game and an advanced version, which makes it a bit more detailed. I struggled with giving this a 3 out of 5 and probably should have given a 2. The fact of the matter is there is a ton of randomness in this game but it doesn’t bother me as much as other randomness in games. 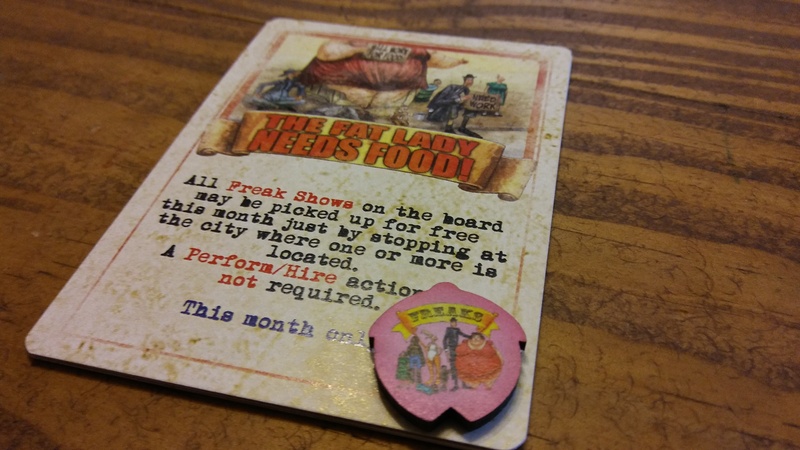 The overall strategy in this game comes in the action cards. When to play which one and when to hold on to the others. Since you can’t get you’r cards back until you use all of them, it is really key to when and how you play them. You immediately know when you played something wrong and kick yourself for doing it. But the randomness is bothersome. The destinations that get tents is randomly determined, the type of tent that comes out is also random, rolling to acquire talent is my major issue. To recruit talent you go to a city that has available talent from a bankrupt circus then you roll a die…..UUUHHHGGGG! If you roll a 1-4 you get the talent, if you roll a 5 or 6 you don’t. If you roll dice like me, you will understand my concern. It is pretty brutal to waste a whole turn trying to get talent and then it all be for nothing just because of a roll of the die. Luckily the advanced rules fixes this by adding a reputation track. The better your reputation the easier to roll for talent, 1-5 gets the talent instead of a 1-4. Overall, I am extremely happy with Circus Train. It has such a unique theme that it is just fun. 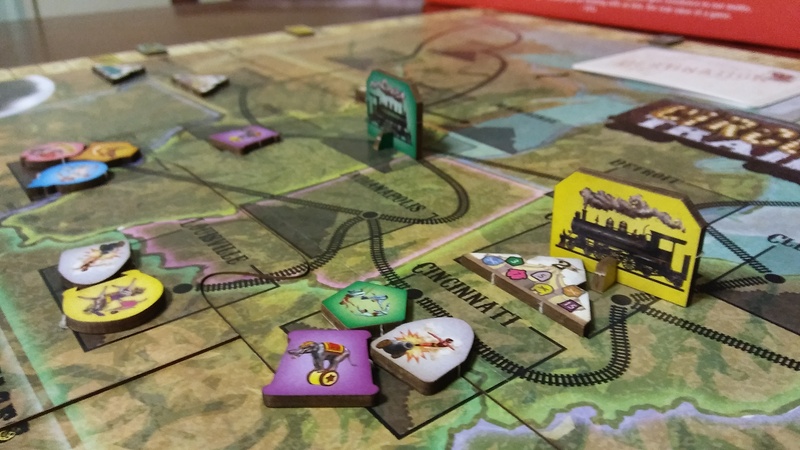 The mechanisms really bring out the theme and you can tell that there was a ton of thought that went into the design of the game. Every thing from the components to the scoring make so much sense. There is a bit of randomness and take that elements that I could do without but it doesn’t deter me enough to not like the game. The mechanisms are simple enough to understand yet provide lots of decision making and strategy. It’s a pick up and deliver game with out the deliver…..it’s a contract fulfilling game with out the fulfilling, it is very good. It will be staying in my collection for the foreseeable future!